Is it possible to guarantee maximum tartaric stability while enhancing the organoleptic authenticity of the wine? 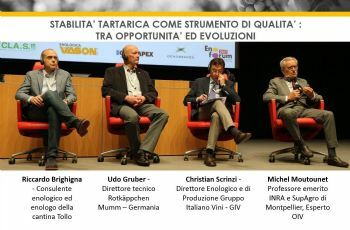 Starting from this fundamental technical challenge for companies, the round table organized by Vason at Enoforum 2017 offers an overview of the new techniques that ensure maximum tartaric stability, but at the same time are able to enhance the organoleptic authenticity of the wine. After a brief historical excursus by Michael Moutounet on the different technologies available, on their evolution and on the questions raised by each of them, the round table analyzes this problem from the winemaking point of view. Christian Scrinzi, wine director of GIV, describes the various reasons that led to the implementation of the technique of electrodialysis in the different realities that make up the GIV: small cellars but also larger realities, indistinctly on white, red and rosé wines and on IGT, DOC and DOCG. Following Udo Gruber, director of the Rotkäppchen-Mumm winery, offers the point of view of a sparkling wine company on the application of electrodialysis. Finally, Riccardo Brighigna, winemaker of the Tollo winery, analyzes the practical experience of using mannoproteins in the cellar.